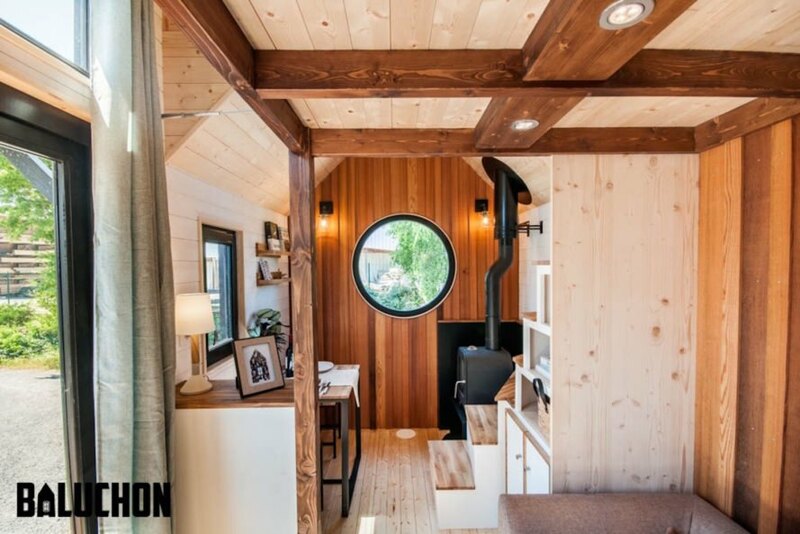 Rustic French charm and modern luxury come together in this beautiful tiny home on wheels. 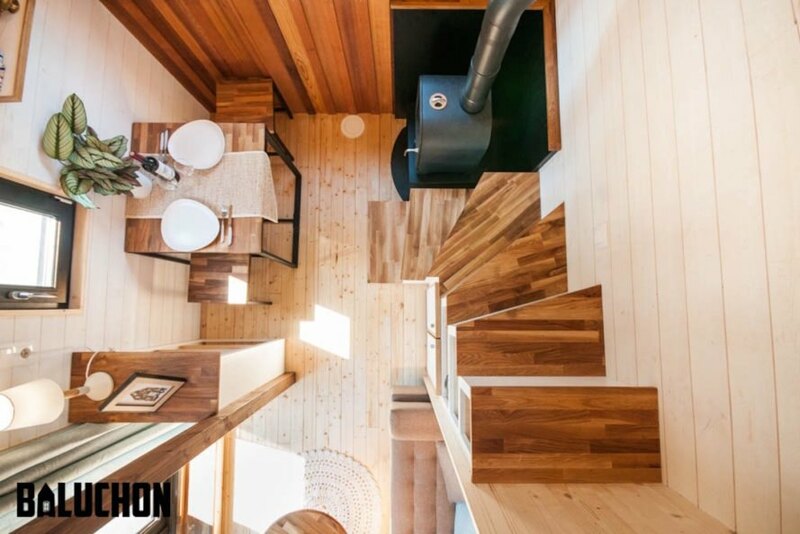 France’s tiny house company Baluchon has outdone themselves again in their latest build called the Ostara, a tiny home built on a six-meter trailer. Currently located near a horse farm in Toulouse, the light-filled timber abode looks surprisingly spacious despite its small plan, which sleeps two in a loft bedroom. 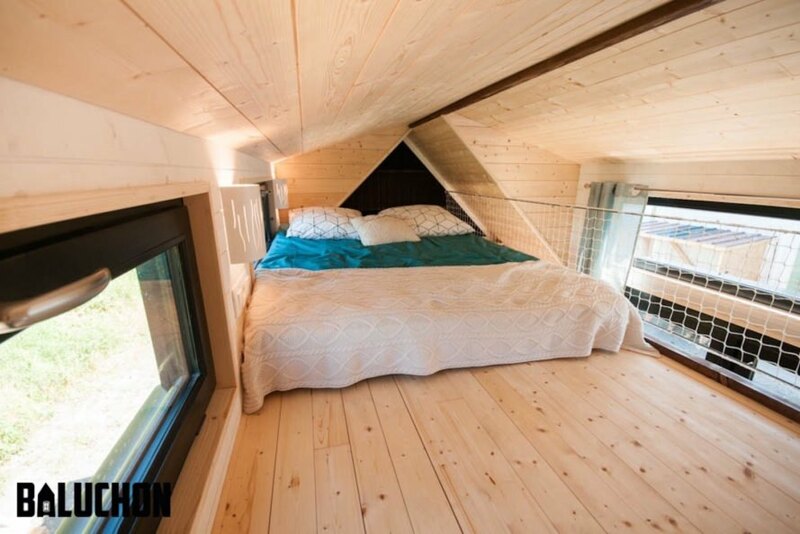 Custom built for clients Nathalie and Sebastien, Ostara was named after the stable close to the tiny home’s location. 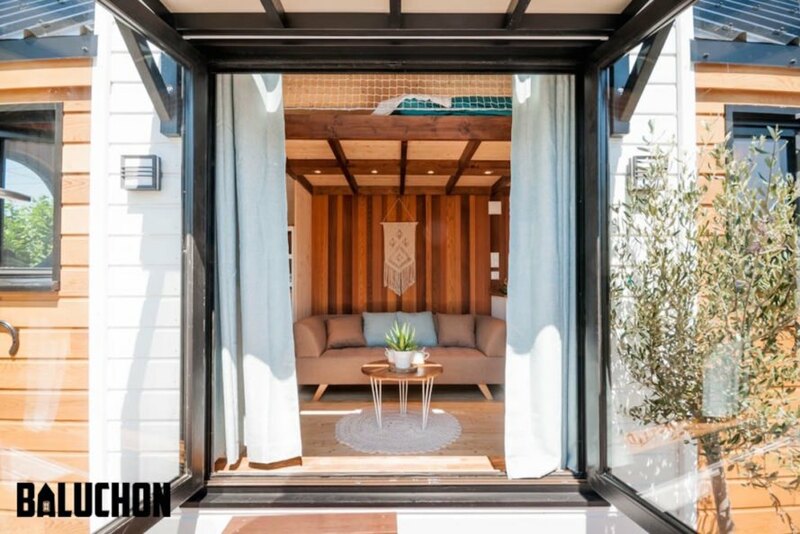 Although charming and rustic on the outside, the spruce-clad Ostara makes a grand impression with its large French doors flanked with curtains that open up to a light-filled living room. A large 1.8-meter-long sofa forms the living room’s focal point and can also comfortably lodge an overnight guest. A small bookcase, wood-burning stove, and a small dining table that accommodates three people is located to the left. To the right of the living room is the kitchen with a full-size sink, pantry, two-burner stovetop, fridge/freezer, and a gorgeous extendable wooden countertop. The bathroom with a full-size shower and composting toilet are tucked into the end of the home. A corner staircase with built-in storage leads up to the mezzanine with a large loft bed. Multiple double-glazed openings, including a broad bay window and one-meter-wide circular window, punctuate the home and provide views of the horses and rural surroundings. Sheep wool, cotton, linen, hemp, and wood fibers were used for insulation. The home is made from locally sourced materials. Baluchon’s beautiful homes are only delivered in France due to the company’s desire to limit carbon emissions. While the article says this is clad in spruce, I doubt that. While the flooring looks like second-growth softwoods (notice the knots), the cladding and interior wall look suspiciously like old-growth Western redcedar. This is a standard look for cladding, soffits and has become uber-popular for walls, too. Notice not a single knot in any of that wood. That range of color is also typical, especially the change in color from one edge of a board to another, a result of the tighter grain across the diameter of the tree. The trees from which this “clear” cedar is obtained are typically from 800 – 1800 years old! Using this material is decidedly *not* sustainable. If it’s reclaimed, the company should tout that, so people can understand the difference, since emulating this look without mentioning the source, just perpetuates the demand for the clear (old-growth) material. 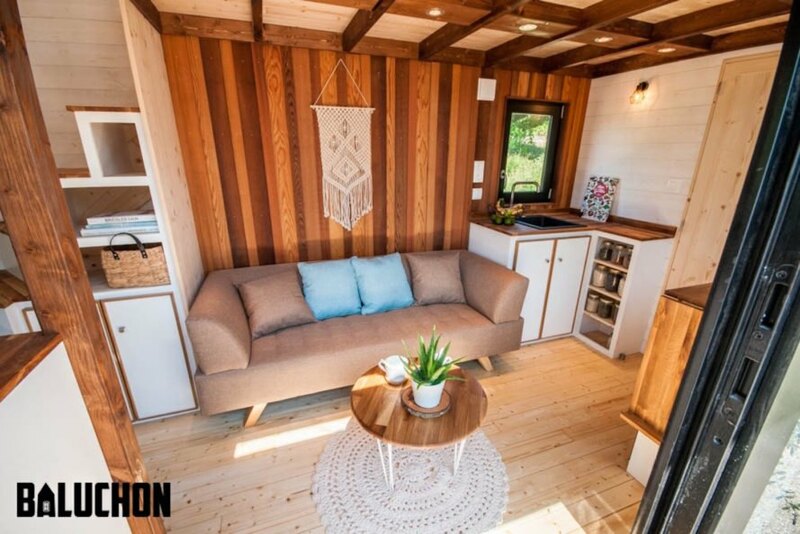 French rustic charms and modern luxuries come together in this beautiful tiny home on wheels. 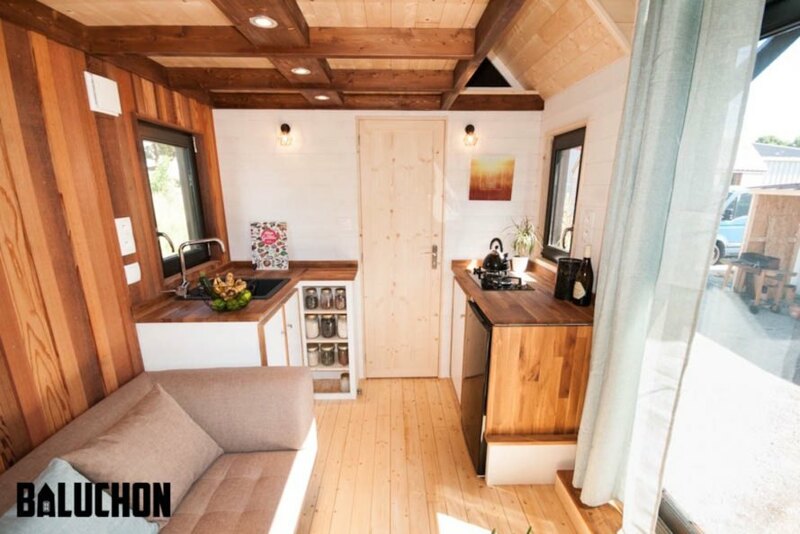 France’s tiny house company Baluchon has outdone themselves again in their latest build called the Ostara, a tiny home built on a six-meter trailer. 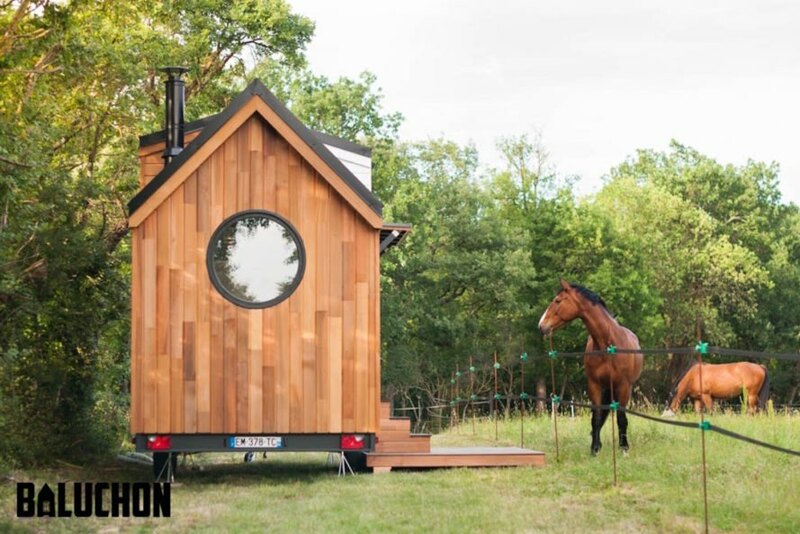 Currently located near a horse farm in Toulouse, the light-filled timber abode looks surprisingly spacious despite its small size and sleeps two in a loft bedroom. 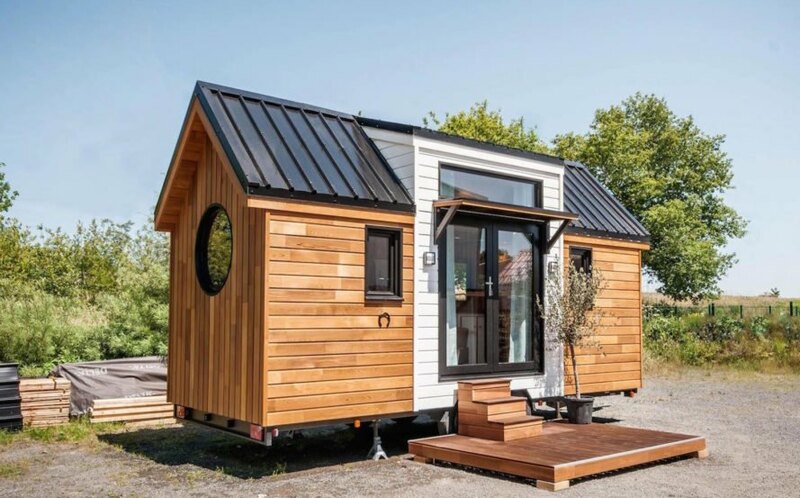 Custom built for clients Nathalie and Sebastien, Ostara was named after the stable close to the tiny home’s location. Although charming and rustic on the outside, the spruce-clad Ostara makes a grand impression with its large French doors flanked with curtains that open up to a light-filled living room. A large 1.8-meter-long sofa forms the living room’s focal point and can also comfortably lodge an overnight guest. A small bookcase, wood-burning stove, and a small dining table that accommodates three people is located to the left. To the right of the living room is the kitchen with a full-size sink, pantry, two-burner stovetop, fridge/freezer, and a gorgeous extendable wooden countertop. The bathroom with a full-size shower and composting toilet are tucked into the end of the home. A corner staircase with built-in storage leads up to the mezzanine with a large loft bed. Multiple double-glazed openings, including a broad bay window and one-meter-wide circular window, punctuate the home and provide views of the horses and rural surroundings. The home is made from locally sourced materials. Baluchon's beautiful homes are only delivered in France due to the company’s desire to limit carbon emissions.